The Magnetospheric Multiscale mission, MMS, was launched in 2015 to study magnetic reconnection — the explosive snapping and forging of magnetic field lines, which flings high-energy particles around Earth. MMS was built with state-of-the-art instruments that take measurements with nearly 100 times better resolution than previous instruments. After two years of studying magnetic reconnection in Earth’s magnetic environment — the magnetosphere — on the dayside, MMS elongated its orbit to begin looking at reconnection behind Earth, away from the Sun, where it’s thought to spark the auroras. Studying the solar wind is best done from in the solar wind, but most of the time, the four MMS spacecraft orbit within or on the edge of Earth’s magnetosphere — where the magnetic field creates a buffer that protects the spacecraft from the solar wind. Occasionally, however, routine orbital adjustments, used to maintain MMS’ elongated orbit, take it well outside. This year, a boost to the spacecraft orbit is taking MMS entirely out of Earth’s magnetic environment and past the bow shock — a region where the supersonic solar wind slams into Earth’s magnetosphere. At such a distance, MMS passes through the solar wind itself, which allows a window of time to study the region’s turbulence. 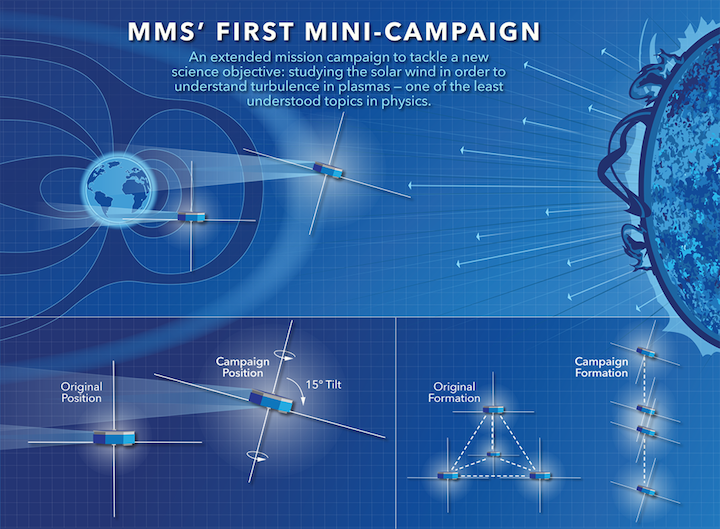 This infographic compares the four MMS spacecraft's normal orientation and formation to the orientation and formation for the mission's first mini-campaign to study turbulence in the solar wind.